Can you believe that's four Disneyland parks around the world that I've visited now? I never thought I'd get round them all, but seeing as I'd done three already, I decided that I had to visit Tokyo's too! So at this point, the last two are definitely on my bucket list now. My previous posts about the parks in Florida, Hong Kong, and Shanghai are all linked here as well. Tokyo actually has two parks, Disneyland and DisneySea, but I wasn't going to have time to visit both (on this trip anyway!). 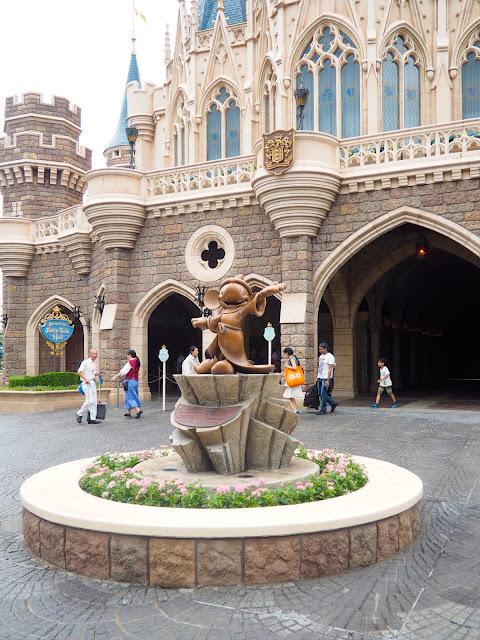 I'd read online that DisneySea is excellent, but I opted to prioritise Disneyland, since I'm trying to visit all of those now, and that's where I'd find the castle, fireworks, and various rides that I all associate with Disney. After all, if you only had time for one of Orlando's parks, it would be the Magic Kingdom over the rest, right? This was also my first solo trip to a Disneyland; while it could get a little boring at times, mainly while waiting in lines, it did give me freedom to dash about as I pleased, and it didn't matter much on rides or watching shows, when you wouldn't be talking much anyway. The only disappointing thing was that I'd hoped I'd be able to utilise single rider lines, to cut down queueing time, but there weren't any such lines! Often I ended up in a car or row on my own instead, after waiting in the normal line. I was able to make use of Fast Pass a few times, where you go pick up a ticket for the ride in advance and return during your designated slot, and join the significantly shorter fast pass line. The passes go quickly though, and sometimes I would go to get one (you have to wait about 2 hours in between collecting each new one) and find that the time it was for was during a parade or show in the evening, as all the earlier times were full. I definitely ping-ponged around the park in a weird order, to see shows and parades, to pick up and then later redeem fast passes, or to skip buy rides and return later when the line had shrunk. My fear of heights ruled out Splash Mountain and Space Mountain though, which are two of the busiest rides there, so I saved a lot of time there! I started off my day in Tomorrowland, where I'd gone to pick up the Monsters Inc Fast Pass first, having read that it's one of the most popular rides there, and sure enough, my pass was for 1.30pm even though I arrived at the park at 8.30am! I headed to the Star Tours ride next, which I think is the first Star Wars ride I've done in any park - Hong Kong's Tomorrowland was being renovated to include it during my visit there! I loved it though, a 3D journey through space and to various planets, with the room moving around you to add to the sensation. I was a tad worried about heights and the movement, if it were too realistic, but I was fine throughout! It's piloted by C3PO too, though he only talks in Japanese, so I don't know what the plot line was. From there, I hopped back across the central courtyard - I stopped to take photos of the Cinderella Castle from various angles throughout the day, but I think this was the only time I passed the statue of Walt Disney and Mickey Mouse - and headed to Adventureland. There were several rides here I wanted to do, and I managed to whizz through them all with 15-20 minute wait times, before they got busy later on. 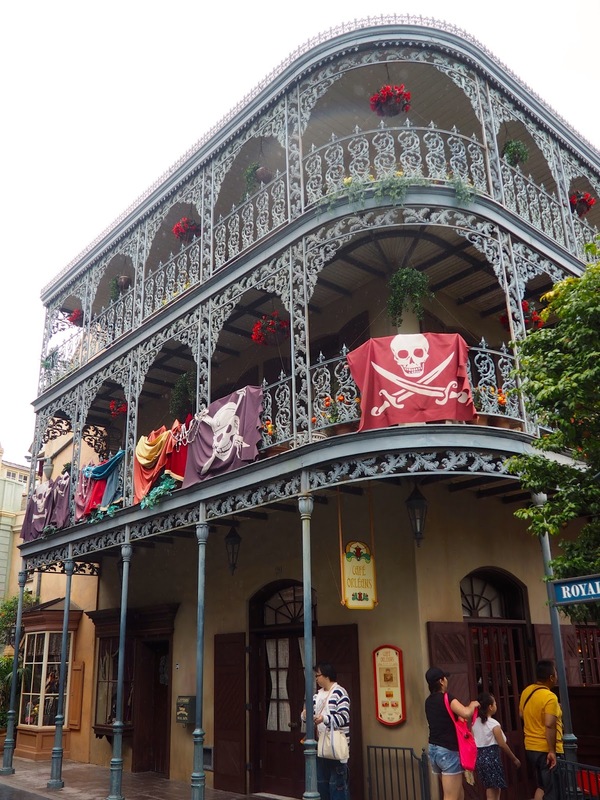 First was Pirate of the Caribbean ride, a favourite of mine in every park. It was similar to the one in Florida, lacking the new technology in the Shanghai version, but it's still a fun ride, and I'm always astounded by the detail that goes into all the sets inside their rides. I also got a fun little surprise as I entered, since Jack Sparrow was there in person, welcoming everyone in, and he spoke English this time (he only spoke Chinese in Shanghai)! I picked up a pirate medallion in the gift shop after, since I didn't buy anything in the Shanghai park, but the Pirates ride was my favourite there. I liked the area the ride was in too, with the surrounding shops and restaurants made to look like a New Orleans street. I jumped on the Western River Railroad next, a steam train that circles through Adventureland, Westernland, and Critter Country, including both the rivers in these areas. It was raised high, so there were good views of the rest of the park, but also a few scenes set up along the way, only visible from the train. There was commentary about the scenes too, but only in Japanese - this park had more english options than Shanghai did, especially as many of the characters still spoke English, and most songs weren't translated, but there were still times when it was Japanese only. The scenes were mainly Western in theme, including deer, railway towns, and Native American camps. 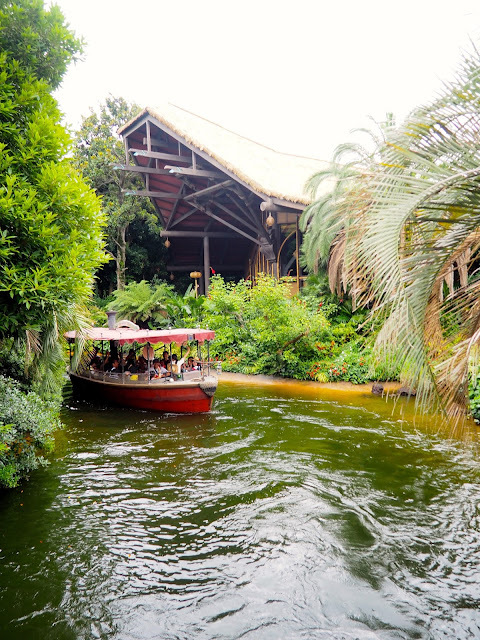 Then I did the Jungle Cruise, another ride familiar from other parks, but always enjoyable. Again, Japanese only, so I didn't understand the jokes, but I still love seeing the detail in all the animatronic animal scenes, including gorillas trashing the camp, elephants playing in the waterfall, and snakes emerging from ancient ruins. My last stop in Adventureland was The Enchanted Tiki Room, a short show featuring Stitch. I'd read mixed opinions of it online, but I adore Stitch, so I wanted to check it out. I could loosely follow the plot; you entered to watch a musical performance put on my birds and singing flowers (all animatronics), but it gets interrupted by Stitch, who wants to join in, and eventually he emerges in the centre with his ukelele. It used songs from Lilo and Stitch, but translated into Japanese, as was all the dialogue. It was definitely a more unusual show, but I enjoyed it anyway, and it only lasts about 10 minutes. I grabbed a quick lunch and coffee from a stand in Westernland - the pork rice roll was very tasty! - then joined the line for the Haunted Mansion, one of my longer waits, which took around 40-45 minutes. I hadn't done a Haunted Mansion ride since Florida, so I was looking forward to this one. The effects inside are so much fun - more humorous than scary certainly - and the scale of it all is so impressive when you reach the largest room at the end, jam packed with a host of weird and wonderful, spooky characters. I couldn't help wishing the cars would go a little faster or spin or something, to give it a little more of a thrill, but I enjoyed it nevertheless. A lot of the other rides in Fantasyland were the same as in every park, so I didn't intend to do all of them, especially with their long wait times. "It's a small world", and the Castle Carousel were both closed for renovation anyway. The Pooh's Hunny Hunt ride was supposed to be one of the best, I'd read, but with a two hour wait time, I decided to leave it until later. The other popular one here was Peter Pan's Flight, and with a 40 minute wait time, it was my best option for the time being! It was very similar to the Shanghai version, but it's still a lovely ride anyway. You board your flying pirate ship, and soar over London and off to Neverland, where scenes from the movie come to life around you. It's so well put-together too, as you sail so close to some of the scenes, yet never touching them, and the room where you are over the whole island, surrounded by the stars, is pretty magical. Disneyland is often more about the magic and nostalgia of it all for me, rather than big, thrilling rides, which terrify me anyway! I walked through Toon Town after that, which doesn't have much in the way of rides, bar a couple, but it feels like you've walked straight into the Mickey Mouse cartoons, with all the characters houses brought to life, including Mickey, Minnie, Donald, and Goofy. I didn't line up to go inside every single one, as it was pretty busy by that time of day, but the whole town is a lot of fun to look around. 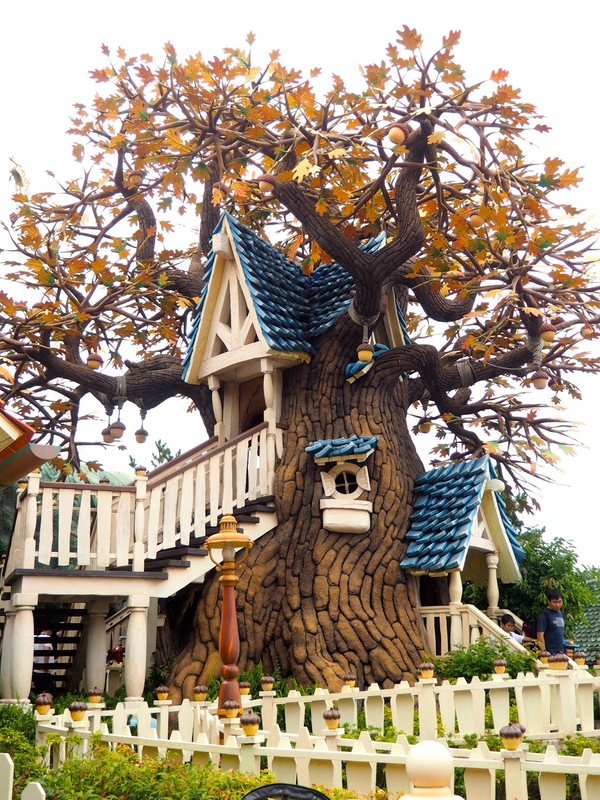 I especially liked Chip & Dale's treehouse, which I hadn't seen before, and there are lots of other buildings besides there houses, like shops, the city hall, and the fire station. The main ride here is Roger Rabbit's Car Toon Spin, not a character who I'd seen featured for a ride in any other Disneyland before! I'm not super familiar with the film, so I didn't understand everything I saw, both during the ride and the queueing area (which took you through the 'back alleys' of Toon Town), but I definitely enjoyed the fact that you could make your car spin! That probably made me enjoy it more than I would have otherwise, but of course, it was incredibly well constructed anyway, and there were little features throughout that break the fourth wall and made it feel like a cartoon in particular. After that, it was time to use my Monsters Inc Ride & Go Seek pass, and see why this ride was oh-so-popular! I think it's mostly because it's quite a unique ride, certainly not one I've seen in any of the other parks. You board your car, and are whisked through various scenes around Monstropolis, filled with monsters hiding everywhere. There is a plot line I think, though it was a little trickier to follow in Japanese, but Sully, Mike, Boo, and Randall appear throughout. The most interesting element is that you have a torch, which you use to 'find' monsters, as when you shine it on their 'M' logo helmets, they make noises or move - often a helmet pops up to reveal it's actually Boo underneath! I certainly enjoyed experiencing a new ride, that I haven't seen elsewhere, as it keeps each Disneyland feeling different and fresh! There was a live show I wanted to see, but it filled up a good half hour in advance, so I had a bit of time to kill before its next showing. I zoomed over to Westernland to grab a Fast Pass for Big Thunder Mountain, though the available time slot was at around 8.30pm! It was too long to wait in the 2 hour standby line though, so I took the pass anyway. While in the area, I decided to go on the Mark Twain River Boat - can someone tell me why this isn't themed around the Princess and the Frog though? - which was a much bigger boat than I'd realised, with three floors to it. It sails around the river in the middle of Westernland, giving you views over to Big Thunder Mountain and Splash Mountain on either side, as well as Tom Sawyer Island and its play areas in the centre. It's a slow, easy ride, but a nice way to pass some time if you've got it to spare. Then I went to visit the Cinderella Castle - I don't think you can enter every castle in every park, but this one was similar to Shanghai's, in having a princess story illustrated inside. 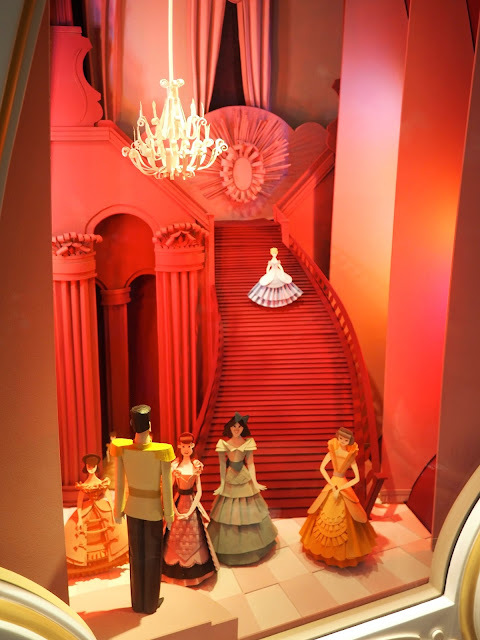 Shanghai featured Snow White, while Tokyo is Cinderella, telling her story through a series of miniature scenes. I liked that each was done in a slightly different style, especially the folded paper ballroom scene. It culminates in the throne room, where people were lining up to take photos sat on the throne, so I admired the room, including the impressive chandelier, before moving on. It was then time for the live show I'd been eager to see 'One Man's Dream II: The Magic Live On', in the Showbase theatre in Tomorrowland. It was a half hour show, that was everything I want from a live Disney show! It featured scenes and songs from different movies, and used both songs from movies and original ones (mainly in Japanese, but I'd rather those be original than translations of ones I know!). I liked the diversity of the scenes featured, including A Bug's Life, Peter Pan, a duet between Louie and Terk, a ballroom dance scene featuring the first 3 princesses, Snow White, Cinderella, and Sleeping Beauty, and a magnificent villain number, with the Evil Queen, Claude Frollo, and Maleficent. It finishes with the original Disney cartoon cast 'filming' in Hollywood, then attending their premiere, and really shows off Mickey Mouse as the star of the whole thing, as well as harkening back to Walt Disney's original dream of creating these films, which is the whole point of the show. It's a nice return to the roots of what the entire Disney company started out as, and I thoroughly enjoyed the whole thing! I didn't have long between the show and the parade, so I used the time to grab dinner before all the restaurants got too busy later. I chose the Queen of Hearts Banquet Hall, having read it was one of the best themed restaurants, and was not disappointed, as I ate surrounded by giant flowers and playing cards, as if I'd walked right into Wonderland! 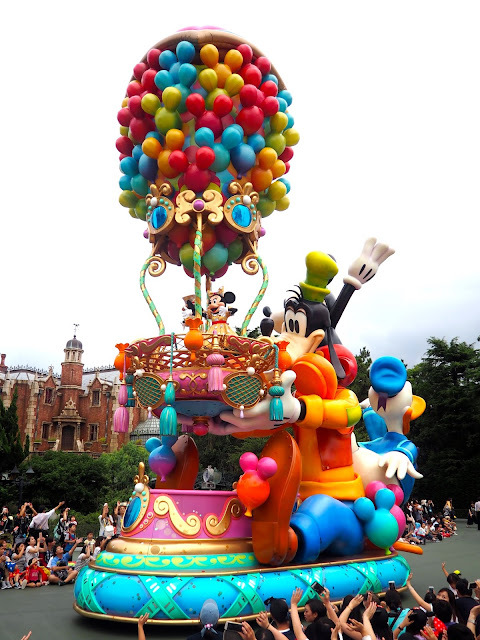 I waited early at the parade route after that, to make sure I had a good view of 'Happiness is Here' - the attendants were fantastic at keeping the front few rows sitting down, so everyone could see well, and as I was in the first standing row, it was perfect! The shows and parades are usually my favourite part of Disneyland visits, as you get to see all the characters come to life, and it's still pretty magical, even as an adult. The production value in Tokyo was particularly excellent in this area too! I loved that the parade included characters and floats I hadn't seen in other parks, so every parade I've seen has felt unique. I loved the Aristocats, Winnie the Pooh, and Aladdin floats in particular (I've never seen Aladdin and Jasmine for real before! ), and the Princesses and Tinkerbell floats were fabulous too! I also really liked the merry-go-round horses bringing Rapunzel, and later Mary Poppins and Bert past. I watched the parade near the start of its route, so I could jet off again as soon as it was done - I whizzed over to the Pooh's Hunny Hunt queue, correctly guessing that it's wait time would have gone down while everyone watched the parade, and I was right, only having to wait half an hour to get on! I was curious about why it was so popular, and wasn't disappointed! The waiting area took you through the pages of a Winnie the Pooh story book, before the honey pot cars took you into the story itself. It was beautifully created, as you are transported through the Hundred Acre Wood on a windy, autumn day, with all the characters come to life around you. There's scenes inside Pooh's home as well, and in the 'Sticky Place', the honeycomb cave he gets stuck in. More unusual was the Heffalump dream sequence, a dark room with the brightly coloured elephants creatures swirling around; it was more unexpected, but entertaining for sure! I was so glad I went on it, as it was a lovely visit back to the stories that I read and watched as a child - so I couldn't resist picking up a small Pooh Bear soft toy in the gift shop, as a memento of this Disneyland in particular (I got Stitch in Hong Kong, and I'm pretending the pirate medallion was from Shanghai, and I have Mickey Mouse earrings from Florida). Then, since my Big Thunder Mountain Fast Pass was for the time in between the evening parade and fireworks, I decided to join the queue for it now, while I had time to spare. I ended up waiting a little over an hour, my longest wait of the day. This was probably the most bored I got all day, but luckily I remembered I had a book tucked away in my bag! I also wondered why there was no single rider line here, as I then got placed in a row alone, when someone else could have been next to me - surely it'd speed up the line a little? Big Thunder Mountain is one of my favourite rides though, a rollercoaster that's just fast enough for me, with twists and turns but no big drops or loops that I hate. The Hong Kong version, with its section done in reverse, is still my favourite, but this was a lot of fun anyway, and it lasted long enough to make the wait feel more worthwhile. Finally, as night fell, I got some popcorn from one of the many carts around the park - there's about 20, all indicated in the guide map with different flavours available in different locations - and found a spot to watch the parade and closing show from. Again, I have to applaud the attendants, who make sure everyone remains sitting down, and the crowds for listening to them - there's other parks I've been to where the crowds were not so courteous! I was about six or seven rows back, but still got a clear view of the whole parade as we all remained comfortably on the ground. 'Electric Parade Dreamlights' was recently updated, and it was one of my favourite Disney parades I've seen, with incredible production having gone into it. The characters mostly spoke English as they went by, which makes it feel more familiar to me, than the slightly jarring effect when they speak Japanese or any other language. Many of my favourite films were featured, which definitely enhanced by enjoyment, including Tangled (I've never seen Flynn Rider in person before! ), Aladdin, and Beauty and the Beast. The Cinderella carriage and Peter Pan pirate ship were also spectacular, as was the Frozen ice palace and Tinkerbell's fairy grotto. There were some more unusual inclusions too, like Pete's Dragon, which I've never seen before, and it finished with several floats featuring classic characters, which is always a nice way to finish I think. 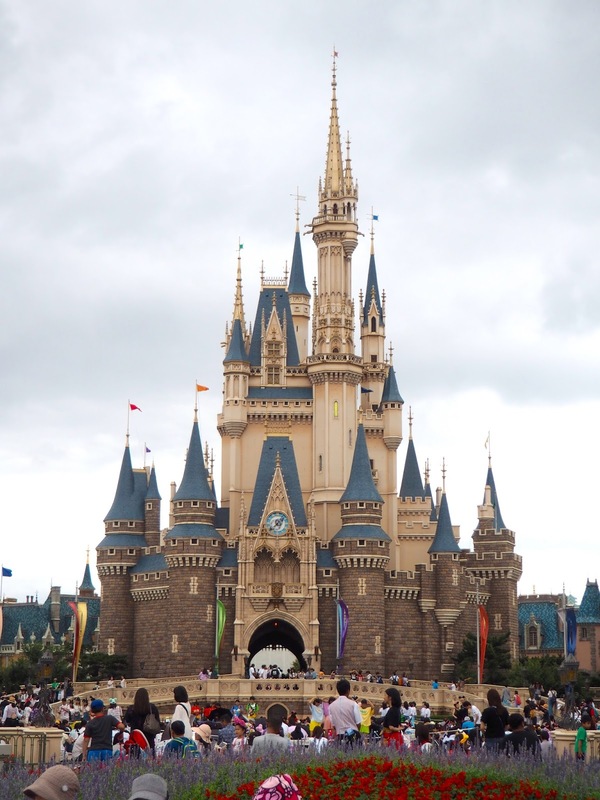 Then, as I'd been seated in the central courtyard, I hopped up and moved a few hundred metres in the other direction, to stand directly in the middle, in front of the castle, for the closing show, 'Once Upon A Time'. It followed a similar format to the other closing shows I've seen, with film scenes projected on to the castle, accompanied by fireworks, and even bursts of fire, at certain points. The narration was in Japanese this time, but from the animation, I could tell that it revolved around Mrs Potts telling Chip the different stories, which I thought was a lovely idea. It used scenes from several of the movies that were featured in the park's other rides and shows, which suggested that these were the most popular here. The castle became a tower of playing cards with Alice in Wonderland, and a massive honeycomb with Winnie the Pooh. I loved the inclusion of the lantern scene from Tangled, with 'I See the Light' playing, as it's definitely one of my favourite movies, and the Cinderella dress transformation was as beautiful as ever. 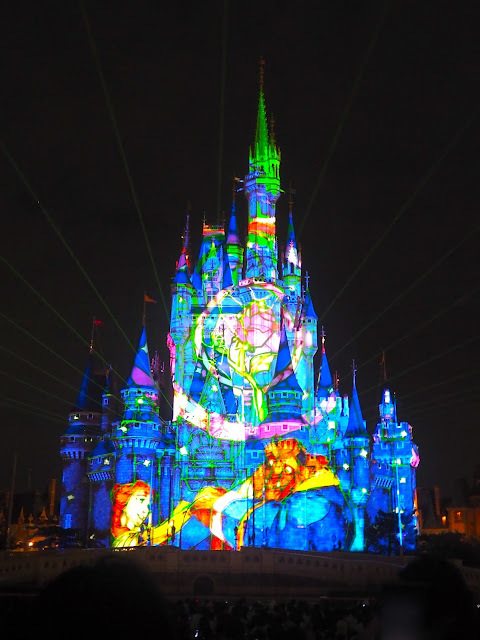 It tells most of the story of Beauty and the Beast, painting the castle like the stained glass windows, before finishing up with a medley of film scenes, set to their original 'Once Upon A Time' song, and dozens of fireworks! Now that I've been to various Disneylands, I can see the differences between them, and the things I like best at each one. The scale of Orlando's means that nearly every film is represented, and everything is in English of course, so it feels the most classic. Shanghai has some of the best rides, with its most up-to-date technology. Hong Kong had some amazing live shows, and I thought it mixed languages between Cantonese and English really well, to make it internationally inclusive. And Tokyo's parade production was some of the best I've seen before. Each park has rides that exist elsewhere, and others that are unique to that location, so no two Disneylands feel exactly the same. But they all have that magic to them, bringing my favourite films, both classic and new, back to life once more, and bringing a little wonder and joy to the world again. Some people question why I've been visiting the Asian Disneylands, when they aren't exactly traditional to this part of the world, but I've had such wonderful, magical days out to them all, and it's nice to feel at home again on the other side of the world, and to see how people everywhere are brought together by the same things.